Translations: TransCorp Releases 'Angelic' Tenshi No Uta English Translation! Re: Translations: TransCorp Releases 'Angelic' Tenshi No Uta English Translation! It's not long, even for SNES standards. There's no in-game timer, but I want to say somewhere around 15 hours. It's very linear and quick moving. It has a few experience checkpoints that will boost you if necessary too, so not much grinding. You can only save in towns except toward the end. Most dungeons are rather short, however I think you might need savestates if you only have short play sessions. That's a fair bit shorter than I was expecting. But that's actually good. It drastically increases the chances of me being able to complete it in the foreseeable future. First,a big thanks and my respect to you and your team Nightcrawler .I visit your webside since 10 years or so and dispite all backsteps you have gone through you really finished the work on this game.Loved the art from the beginning.It looks "other" than the usual SNES RPG. Like others have already written this one runs not in the PSP Emulators and and not on the XBOX360 SNES9x 1.52.But lucky with SNES9x 1.56 in the Retroarch on my Sony Television with Android and after I installed the updates offered in the menues Song of the angel runs fine.Tried also with the BSNES Emus offered in Retroarch.None of them works.So happy after an evening with trying I got this one running. I'll get to this one eventually but it will take a while. Checked if this works on o3DS, and it's playable, but sound, graphics, and speed are always messed up. I'd check with my Android phone, but it's busted. This is a great game, but not too mobile friendly. Retropie users: lr-snes9x appears to run the game correctly. I will be honest, I beat the game and I did not see the point in making the effort to get those black coins for the hidden monster shop. I was quite disappointed on what that shop offered and would not recommend sweating it too much to get those coins. I thought there would at least be some cool armor or something. I guess the heal ring sounded cool but I had so much money I just had endless MP healing items which can just be purchased normally with much less hassle. Plus money is not a huge issue, especially at the end of the game. I also did not see much use of the negotiation level (mine was at 10 by the end of the game) but maybe it had some hidden benefits I missed. I guess it was easy to run from battle? I never had a monster actually help me though even though friendship with some of them was quite high. I got a few interesting items too, here and there, that would sometimes be useful for a bit but everything the game provides for you in the end game surpasses any of those items from what I could tell. Also, for me, the best damage vs bosses was casting "strength up" and just attacking normally. Maybe lucifer did slightly more damage than an attack and maybe one other summon was useful. There were 1 or 2 multi hit spells I used for random encounters. Overall the hacking and translation work were top notch but I did not like the non-descript names for spells and some items. Especially spells, it was just a trial and error kind of thing to see what they actually do so maybe the names can be improved and descriptions added. You know the hidden shop has two different inventories, right? The other set is the only place where you can purchase permanent stat increasing items. The game is of course easy enough without them though. They were full translations from the original game's descriptions. Unfortunately, that's just all they give you! I think that's somewhat common for games of that era. They don't tell you much and expect you to try a bunch of things out. I saw somebody make the same complaint about the Bazoe! Mahou Sekai translation -- it's the fault of the original game, not the translators. Prior to the mid-SNES era (1994-5 or so), the designers assumed you would have the instruction manual to explain a lot of the stuff, or buy their official guidebook for the game, which is always advertised in the instruction manual. Did you guys made the version for the SNES9xGX cause when I start up the game after the title screen it stays at the black screen, am I using the wrong version of SNES9xGX? Is there a list anywhere of which composer did which track? I think I hear Sakuraba in the battle themes, town 3, incident, babel tower, and mountain. Of course there's nothing as bleedingly obivoius as the one track in Cosmic Fantasy 4 that had part of its melody blatantly reused in Tales of Destiny, but his style is there. Maybe Forest is Tamura since it sounds kinda Tales-like but other than that I'm not really sure. 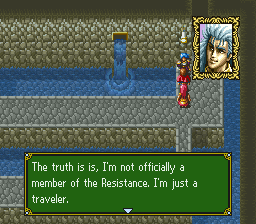 Hi, I'm playing this game (an amazing job with the translation, by the way) and I've found some little typos. I think I'm using the latest version of the patch. 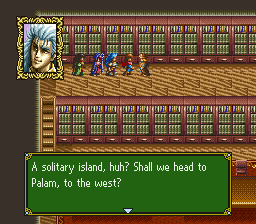 Here the port city of Palman appears written as Palam. I haven't finished the game yet. If I find anything else I'll let you know. Thanks again for this translation. This year I'm having a second adolescence with all these snes translations coming out! Thanks. Noted and corrected for a followup release if I do one. Yeah, it has been a big year for SNES translation releases and updates. The year is not over yet either! I tried to get this game to work on my snes9xgx emulator but it always freezes at the title screen for some reason is it a bug? What version are you using? Try the latest version (4.4.0) if you're not already using it. I'm using a customized version of Snes9xGX 4.3.8, when I started using 4.4.0 like you said and Tengai Makyou Zero and Koryuu no Mimi works but Tenshi No Uta still puts me in a black screen after the girl talks with her dad not going anywhere, but you guys are doing a fantastic job on this rom. 4.4.0 is supposed to use the SNES9x 1.57 core which runs it fine. Can you do a sanity check and confirm you can run it on the regular SNES9x 1.57 desktop version? If it runs for you on the desktop version, there's something specific to the snes9xgx emulator and you may be out of luck. If it doesn't run for you on the desktop either, something must have gone wrong with the patching. I would suggest not using soft patching if you were trying to do it that way. Using the included TransPatch utility or an xdelta patcher would ensure it is patched correctly. You might also want to delete the SRM file created by the old version of Snes9xGX. There's a chance it might be messing something up. @mziab hmm I'll try that just in case. Yeah, it sounds like it it something specific to Snes9xGX then. Did you ever get to make sure you can run it on the desktop OK? The only other suggestion I have is to try several versions of SNES9xGX, or maybe someone's forked version might get it right. I came across posts showing as of 4.3.7, even the original Tenshi No Uta game did not run and black screened after the title screen. The English translation requirements are even more strict than the original. So, they must not be using significant portions of the mainstream SNES9x core and purposely keep inaccuracies for performance or something.